Study after scientific study expounding on the benefits of cannabis as a veritable panacea has garnered baseline skepticism, if not contempt, from the somnambulant corporate press keener to spew the State’s anti-marijuana nonsense than aligning with science proving government irresponsibly wrong on weed. Scheduled for decades as akin to heroin — one of the myriad opiates of which the U.S. is currently experiencing an outright crisis — cannabis has remained the star target of the Drug Enforcement Agency’s contentious war on drugs. But that may be about to change — and soon. A dramatic shift in language on the government’s National Institute on Drug Abuse’s website bears every indication federal prohibition on cannabis’ days are numbered — specifically, as a means to break the chokehold with which opioid medications have stymied the fight against addiction. “Medical marijuana products may have a role in reducing the use of opioids needed to control pain,” the NIDA website now states — startlingly in alignment with voluminous government-funded and independent research. “NIDA funded two recent studies that explored the relationship between marijuana legalization and adverse outcomes associated with prescription opioids. The first found an association between medical marijuana legalization and a reduction in overdose deaths from opioid pain relievers, an effect that strengthened in each year following the implementation of legislation. The population-based nature of this study does not establish a causal relationship or give evidence for changes in pain patient behavior. Hospitals in states where cannabis has been made legal not only failed to see a veritable weed apocalypse in health problems — a notable non-repercussion, demolishing anti-marijuana propagandists’ favored, but completely baseless, tripe — but they also experienced plummeting numbers of patients needing treatment for opioid abuse. Simply put, legal availability of weed does not create a health crisis — and it could be inadvertently solving America’s horrendous opioid epidemic. In states allowing the medical use of cannabis, NBC News reported, the rate of opioid abuse and dependence noted by another recent study plunged 23 percent, while overdoses from opioids slid an average of 13 percent. That study, published in Drug and Alcohol Dependence, found no significant correlation in increased hospitalizations for cannabis-related illnesses in states where the plant has been legalized for medical use — effectively putting to bed that particular demonization of weed by sanctimonious politicians harboring pro-drug war agendas. “Instead, medical marijuana laws may have reduced hospitalizations related to opioid pain relievers. An approximate 60 percent of Americans now reside in the 28 states and District of Columbia where cannabis has been legalized for medical use — more, still, in round out the number of people with legal, recreational access — and, in all of those locations, the little plant that can has been destroying decades of politicized anti-pot propaganda. Better still — and as multitudinous government and independently-funded scientific studies show — legal cannabis helps alleviate the opioid epidemic currently choking the United States. While heroin, morphine, and other illicit opiates contribute handily to the epidemic, legally prescribed opioid painkillers — such as name brands Oxycontin, Vicodin, Percocet, and many others — have been central to the ever-growing crisis, with doctors frequently turning to the societally-acceptable, highly-addictive substances to offer patients relief. This flippant penchant for prescribing opioids damns patients in two ways. First, under-prescribing often leaves those experiencing legitimate, stultifying pain with a set number of pills for relief. Second, terminal prescriptions — where relief has yet to be achieved for an acute ailment by the time medicine runs out — leave thousands bereft of pain relief, and thus, tempted to turn to illegal avenues to do so. Of course, the pharmaceutical industry has been profiting handily from the uptick in legal opioids — that uptick incidentally coincided with an astronomical surge in opium production in Afghanistan, where the supply had been all-but eradicated prior to the U.S. military invasion in 2003. But, whatever complex web of societal and world issues created the current opioid crisis, these studies — and a potential looming capitulation from the federal government — prove cannabis holds promise in reducing dependence, if not stamping out the epidemic, altogether. Although the authors of this and other studies have yet to state as much, the irony of cannabis — a plant — occupying the same rung on the Drug Enforcement Agency’s blacklist of substances not meriting any medical value cannot be emphasized sufficiently. However, if the definitive switch in stance from the National Institute on Drug Abuse can be a positive portent for the near future, it’s entirely possible politicians and policymakers have finally — at long last — come to their senses on the seeming innumerable benefits of cannabis. 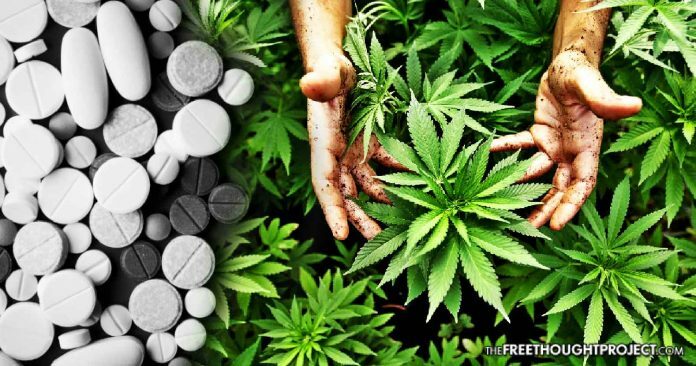 Ending cannabis prohibition — and the entire drug war — would do more to help those addicted to Big Pharma’s opioids than any disingenuous moralizing about ‘drugs’ ever could.